Burrow Bed for your pet! - Ring stays open so your pet can get in easily & able to see what is going on in their environment while feeling comfortable & safe! 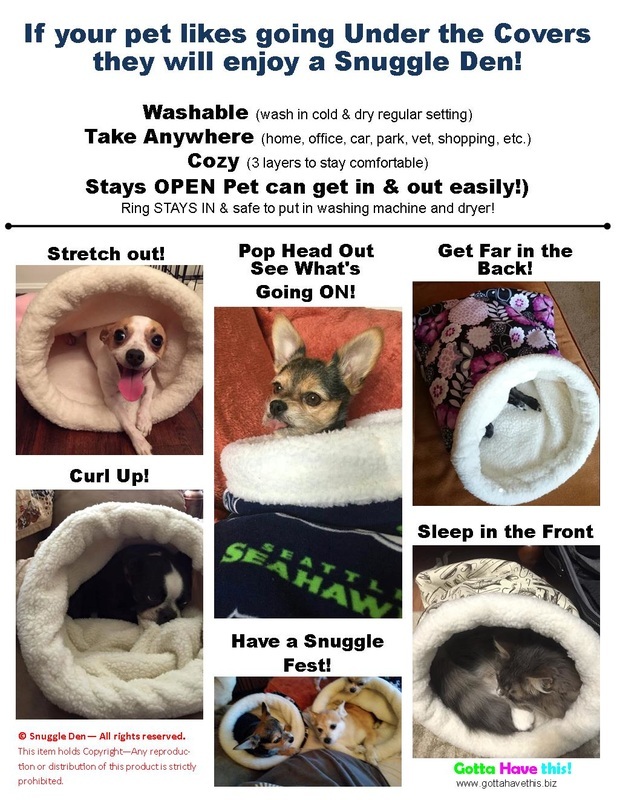 High quality, handmade snuggle dens for your dog, cat or other furry family member who loves to get under the covers and burrow. Also known as; burrow bed. dog sleeping bag, snuggle sacks and cave beds. Use them everywhere—when you travel in the car, the crate or even when going to the vet! Three layers, very cozy & comfy! Each Snuggle Den is made of high quality material, inside and out with fleece between that makes for warm and snuggle-worthy comfort for your dog, cat or other furry family member. Miniature Pinschers ● Chihuahuas ● Boston Terriers ● Italian Greyhounds ● Miniature Dachshunds ● Dachshunds ● Yorkies & many more! These dog burrow beds are hand crafted in the USA by Gotta Have this! Machine washable and tumble dry makes it easy care. Your furry one will love it! © Snuggle Den— All rights reserved. This item holds Copyright—Any reproduction or distribution of this product is strictly prohibited.